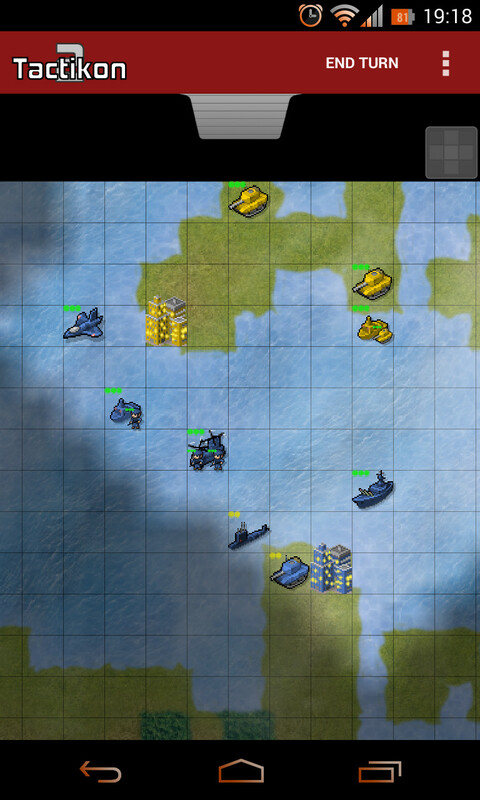 Tactikon 2 is a FREE turn based strategy game available in the Google Play store here.. It launched the 17th of April 2014. It was created as an upgrade to the original Tactikon with more units available, better A.I., and even more features. 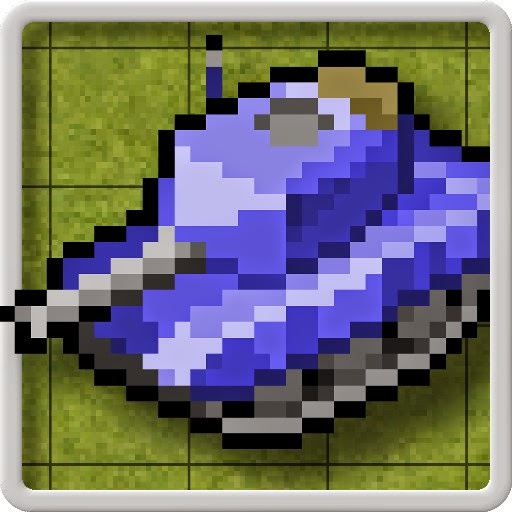 It is reminiscent of other 16-bit TBS games like Advance Wars. It has a retro look that doesn’t hamper the gameplay. 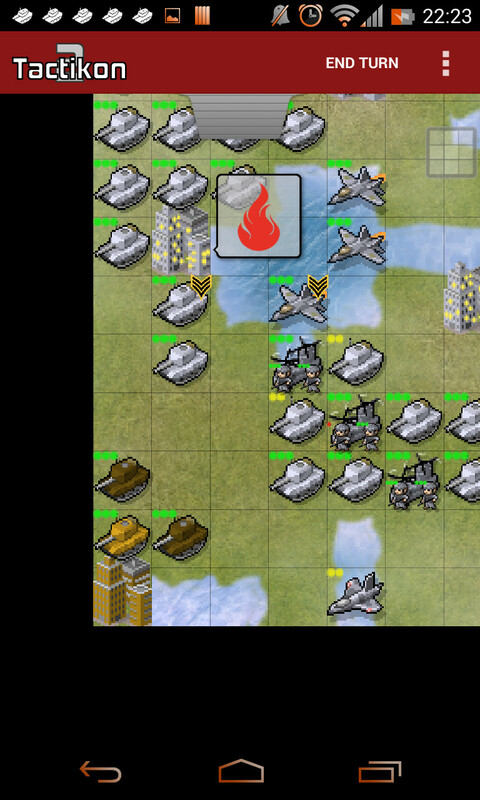 In fact, don’t let the graphics fool you, the larger the armies get and the more units are on the battlefield; I’m sure your device will thank you for the simpler graphics. While the gameplay is fairly simple, it does take some strategy to win on a map. Gameplay consists of you starting with one city (your HQ) and at least one unit. The initial goal is to grow your army as best as possible and to reach the map goal: which is one of 3 Victory goals, Total Annihilation, Take over Enemy HQs, or take over all Enemy Cities. Only 2 unit types may take over a city that is neutral or razed, Infantry and Tanks. Each unit type take a certain number of turns to build and each city has a maximum of 4 slots. *Destroyers (massive ships that can attack up to two squares away). *Transports (boats that can move 2 ground units at a time). *Choppers (can carry a max of 2 infantry). *Fighters are Jets with aerial superiority. *Bombers are Jets designed to target ground units. These units get upgraded to skilled veteran status for each successful fight they’re in that they survive. In addition, unit may be healed/repaired in any city you own after receiving damage. This will stop any current unit being built until the damage is resolved. Terrain plays a pretty big role in your overall strategy as ground units move over different terrain types at different speeds, water units are (obviously) limited to water tiles unless docked at a city; and air units have the longest range but have limited fuel and must land on a carrier or in a city to refuel or fall from the sky. Each unit has strengths and weaknesses and there is a robust help file in-game to help you see how they stack up. Plus, each time you attack, you’ll be able to see the odds of your success. This game is difficult to master and the A.I. is pretty intuitive which will give you some challenging gameplay. If playing offline, you can play against the A.I. in a single player mode or multiplayer by handing your device to your friend/family member to take turns (Local Multiplayer). It is recommended that you put some time into the Single Player & Local Multiplayer modes before taking on the online multiplayer mode as you’ll need to learn how everything I’ve described plays out and how the pacing works. You can play with up to 8 players total in a multiplayer game. One of the best things about this game is the multiplayer support online. It uses its own setup and servers to host and run the games. You’ll have to make your own profile by choosing your Commander’s name and your Army’s Icon and colour. After that, you can join or set up online games. The servers keep track of your total number of games you’ve played, how many you’re currently playing, your win/loss ratio, and provide you with two sets of rankings. The first ranking is your Rank as a Commander (following military titles of rank) and the second ranking shows how you rate overall amongst all of the other players at your rank worldwide. After further research, it appears that your Rank improves by virtue of the number of games you completed. You move from Private after 10 games and the remaining Ranks open up at the double of previous Rank. So 10, 20, 40, 80, 160, etc. How you rate at that Rank is determined by your W/L ratio out of all of the other players with the same Rank. To my knowledge, there aren’t any perks with each promotion…just the ability to show that you have risen the ranks to be the best player (or not) in your overall rank. You can also add friends from the other players you face (long press the match from the title screen to bring up this option) and even block players should they be an issue to you. I’ve never experienced any issues which have led me to blocking any player, but I have to add that there is even a simple and effective game chat built into each match. You simply drag a tab located at the top center of the match you’re in to access it. There is a character limit, but you also have the option of whispering to certain players instead of just talking to everyone at once. *Basic size of the overall map. *Ability to turn on/off forests and mountains. *Ability to set city densities. *Ability to mirror the maps with many options for mirror types. *Many randomly generated maps for you to work with. The only thing you’ll not be able to do is actively edit/build the maps on your own on a tile-by-tile basis. The game handles that all for you by using what appears to be Simplex Noise. You will also get a balance rating before you start a game based on how balanced the map is overall. Finally, you can set a time limit for each turn, number of players, victory goal, and one or two other options to tweak. These map options alone give this game a massive amount of replayability. With so many options to tweak and permutations available, you may never play 2 games on the same map (unless you specifically try to). It adds to the overall gameplay because nothing will ever be very stale and also enriches the mind to ever deepening strategy. Each category will have a small blurb about why the rating was given and at least one Pro & Con. The ratings for each of the first four categories will be averaged to get the final overall score followed by my final thoughts. The gameplay is fairly deep for a game that uses very simple gameplay mechanics. It is simple to learn and difficult to master. ~The simplified gameplay allows for anyone to play. ~The maps can be made to incorporate many different strategies and massive replayability. ~For its simplicity, the rules could use a few small additions. ~Some have asked for additional units/unit types and/or a tech tree or upgrade system. The game uses simple 16-bit graphics to give it a retro feel and keep the processing power down. The Sprites and tiles are animated to give it a sense of motion and make the maps feel alive. Simple palette swaps for color differentiate between player’s Armies. ~The simple style allows to easily make out units and terrain types with relative ease. ~The simplified graphics may be overlooked by many who would miss out on a great game by judging the graphics alone. ~The terrain needs more variable tiles like roads, bridges, sand, snow, etc. As of yet, there is no background music or sound effects to accompany the gameplay. As you’ll see in my interview (see after the final score), those ideas are currently in the works to be added; possibly in a future update. This is really where the gameplay shines. Whether you are playing against friends in the same room or playing online, you’ll have more fun playing this in multiplayer mode. This game does MP in such a simple way that many other Developers need to take notice. ~ Turns can be set to 24 hours so you don’t have to miss out. There are also notifications that pop up. ~ The community has yet to really embrace this aspect fully. While the actual score was 3.75 as an average…it is closer to 4. This game is still early and there are many things that can and will hopefully be added to make it an even better experience. If you are a fan of strategy games and especially TBS, then this game is a must have. There is a toggle for difficulty, so anyone can try it out. Like a fine game of chess, it gives back when you find a good strategy that works. Plus, it can be a on the go game when you have a few minutes to kill or can eat hours away. There is a lot of promise to this game and I hope that a community grows around it even more and embraces it. The stage is set for some explosive community activity. I won’t put a wish list here…but as a fan of Strategy games myself, I can easily see where this could go if it were also applied to a broader 4X TBS style of game. James Payne, Founder of Eidolon Industries. James, thank you for taking the time to interview for this article. Q: What led you to develop games, especially for Android? A: It’s about knowing that other people are enjoying something I’ve made – years ago it was a computer lab full of fellow school-kids, but these days platforms like Android make it easy for indie developers to get their games in front of thousands of players and get almost instant feedback. Q: Is T2 still in progress? What future aspects can we look forward to and, if possible, when can we expect them? A: The gameplay is more-or-less where I envisioned it, so future changes will be around the edges – better social features, sound and music, UX improvement and more advanced map customisation. Q: How many people are part of Eidolon Industries? A: Just me – with the occasional collaborator for art and music. Q: Tactikon 1 and 2 have been produced by Eidolon Industries, are there any new games in the works? If so, what are they? If not, what other games/types are you interested in trying to make? A: Lots of ideas came up for Tactikon and Tactikon 2 which don’t really fit in that game, you know, ideas that went away from the core game mechanic too much – so I’d like to spin off a new strategy game in a slightly different direction. I think the async multiplayer model works well on mobile so I’ll carry on with that for a while at least. Q: Besides your own game(s), what games or types keep you busy? A: I mostly stick to handheld gaming these days – there are lots of decent strategy games on the 3DS like Fire Emblem, also RPGs and adventures. Elite: Dangerous might get me back in front of a PC again, though! Q: With the success of T1 and T2, what advice would you give to someone with the dreams of making games? Q: What other hobbies do you have? What do you like to do to relax/decompress? A: While working on T2, I was spending about 50% of my time doing home improvements – actually, I think I was coding to relax from all the building and decorating, haha. Q: Finally, where do you see this going? Where would you like Tactikon 2 or even just Eidolon Industries to be in 5 years? A: Hey, so long as there are more players to challenge in T2 I’ll be happy. I’d love to have more time to dedicate to making more and more ambitious games. Five years is a long time though, who knows! Thanks again to Mr. Payne of Eidolon Industries for making some of the best and easiest to get into strategy games for Android and for taking the time to interview for this piece. If anyone wants to play a game of Tactikon 2 with me, you’ll find me as LordofSyn (of course). Thank you, Devoted Reader for taking the time to read all the way to this closing statement. Thank you for your continued support. Thank you to the Independent Developers who are striving to keep the passion for games overall and lighting the way for future generations to come. If you are a game developer (especially for Android) and would like to see your game reviewed and are interested in doing an interview please let me know. 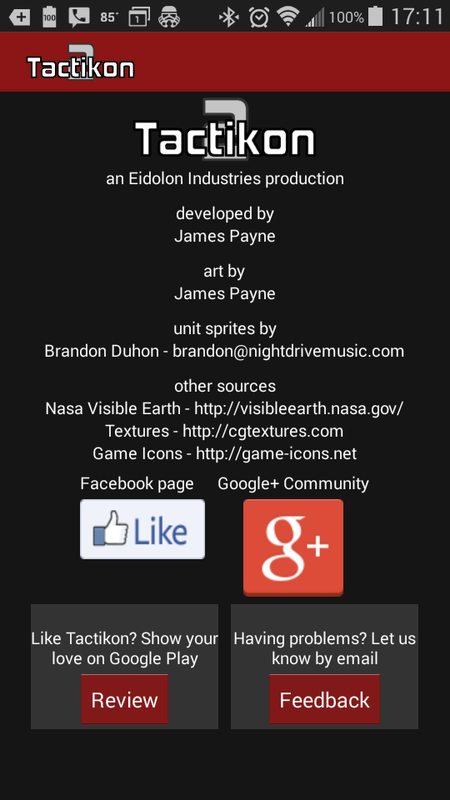 This Post was posted in Android, Games, Independent Games, Indie Games, Mobile gaming, Multplayer Games, Strategy, video games and tagged Android, Android multiplayer games, android strategy, Eidolon Industries, James Payne, mobile strategy, multiplayer games, retro feel, retro graphics, strategy games, Tactikon 2, TBS games, turn based strategy games. Bookmark the permalink. The System of goals inherent to evolution of life and communication. Syn’s Arcade is nearly finished!